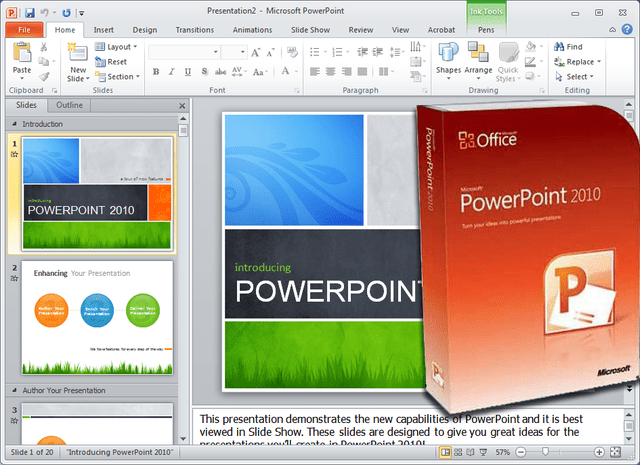 Design themes were first introduced in PowerPoint 2007. They work in a similar way as the design templates in earlier versions of PowerPoint. A really nice feature of the design themes is that you can immediately see the effect reflected on your slides, before making your decision. Hover your mouse over any of the design theme icons shown. The design is reflected immediately on your slide, so you can see how it will look if you apply this design theme to your presentation. Click the design theme icon when you find one that suits your needs. This will apply that theme to your presentation. The design themes that are immediately visible on the Design tab of the ribbon are not all the themes available. You can scroll through the existing design themes by clicking on the up or down arrows to the right of the themes shown, or click the drop-down arrow to reveal all of the available design themes at one time. More design themes are available to download from the Microsoft site, by clicking on that link. Once you have selected a style of design theme that you like for your PowerPoint presentation, you are not limited to the color of the theme as it is currently applied. Click on the Colors button at the right end of the design themes on the Design tab of the ribbon. Hover your mouse over the various color schemes shown in the drop-down list. The current choice will be reflected on the slide. Click the mouse when you find the right color scheme. Each design theme is assigned a font family. Once you have selected the design theme for your PowerPoint presentation, you can change the font family to one of the many groupings within PowerPoint 2010. Click the Fonts button at the right end of the design themes shown on the Design tab of the ribbon. Hover your mouse over any of the font families to see how this group of fonts will look in your presentation. Click the mouse when you have made your selection. This font family will be applied to your presentation. Just as you were able to change the background on a plain PowerPoint slide, you can do the same while using one of the many design themes. Click the Background Styles button on the Design tab of the ribbon. Hover your mouse over any of the background styles. The background style will be reflected on the slide for you to evaluate. Click the mouse when you find a background style that you like. Sometimes you want to show your slides with no background graphics. This is often the case for printing purposes. The background graphics will remain with the design theme but can be hidden from view. Check the Hide Background Graphics box on the Design tab of the ribbon. 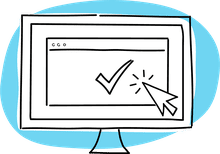 The background graphics will disappear from your slides​ but can be turned back on at any later time, by simply removing the check mark in the box.